Christmas was a perfect day. Leaving Johnny to sleep in, Bill and I left the house early to watch the sun rise over Ft. Myers Beach. 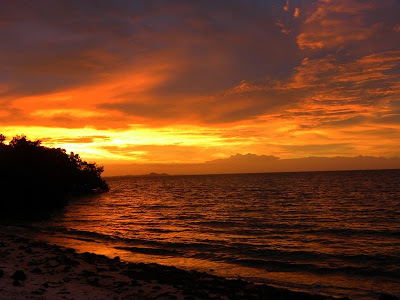 It could not have been more beautiful. My idea of the best Christmas lights ever! Later in the day, Bill cooked a wonderful Christmas dinner - Peppered Standing Rib Roast with Cabernet au Jus, Yukon Gold Potatoes and fresh grilled asparagus. I made a mixed greens and apple salad to begin the meal and pumpkin pie and chocolate chip cookies to finish up. We invited our neighbor Lou to join us. Bill dirtied every dish in the house and I'm still cleaning up - but it was worth it! We ate outdoors on the lanai, relaxed and enjoyed every second. It is especially nice to have son John here for the holidays. This picture was taken at Corkscrew Swamp where John got up close and personal with a brown leaf grasshopper. 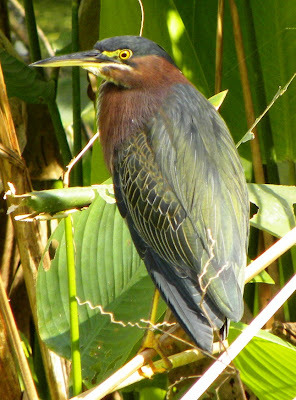 John had never seen a Green Heron before - and this guy was just beautiful! The sun lit-up the colors on his back. I enlarged one of the pictures I took and hung it on the wall in Johnny's room. 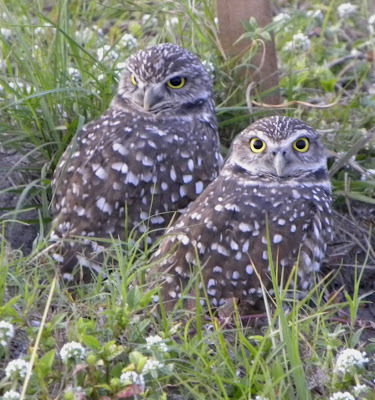 No trip to Ft. Myers is complete without going over the Caloosahatchee River Bridge to Cape Coral to see the Burrowing Owls. John agreed that these diminutive little birds are especially adorable. He took pictures with his camera phone and sent them to his friends before we went to Ariels for a seafood dinner. 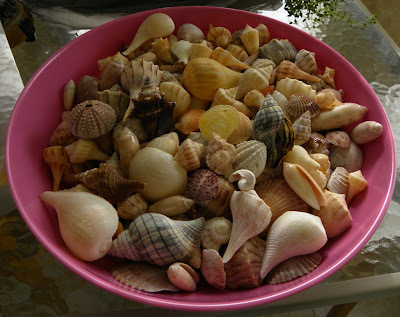 These are just some of the shells I have collected on the beach. I learned that if there is the tiniest bit of animal matter left inside the shell - they soon begin to stink. See that pretty little tulip on top? It's now outside soaking in a bleach solution.